Whereas some research has been conducted on ch’i, scientists have not yet satisfactorily identified, measured, or explained it. Therefore, it is misleading to try to describe ch’i using words like energy or force. Such words are often used but have precise scientific meanings that may not apply. However, ch’i may have a biological basis. Diagram of a plant cell. 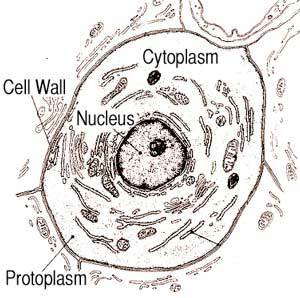 An animal cell is similar but lacks a cell wall. Is Ch’i Related to the Dynamics of Living Cells? When we look at dead cells under a microscope, they are motionless. Much of what we know about cellular changes is from seeing dead cells “frozen” at different stages of development. However, there is a dynamic attribute of living cells similar to that seen in living, single-celled organisms such as amoebas. Living plant and animal cells actually undergo internal movement within the cytoplasm. This activity is termed protoplasmic streaming. Streaming is thought to redistribute nutrients within cells and may help cells to absorb oxygen and nutrients and expel metabolic wastes. In tissues comprising many cells, there may be a corresponding activity involving masses of cells in unison—a sort of wave-like undulation. Such organized motion could transmit vital information from organs and glands to other organs and glands to regulate their activities and secretions. This hypothesis is consistent with the concept that ch’i, blood, and breath are related and that ch’i harmonizes essential bodily functions. It is also consistent with the fact that ch’i is often experienced as a tingling sensation, and its flow is experienced as a wave. The idea that ch’i involves such vital cellular activities explains why it is associated with a healing effect. Arrested or reduced ch’i, which can result from fixations of habitual muscular tension, may stunt normal physiological processes dependent on these activities. Reinstated cellular activities then enable their associated physiological processes to resume. If this interpretation is correct, then exercises that cultivate the flow of ch’i can benefit cells individually and harmonize bodily functions through collective cellular activity. At present, some people who work with ch’i think that it involves electromagnetic energy. Electronic devices have been designed that are purported to locate acupuncture nodes. These devices are used by some acupuncturists. Moreover, acupuncture is thought to activate ch’i through electrical stimulation; that is, the metal of the acupuncture needle, when in contact with dissolved bodily salts, produces an electrical current as do the electrodes of a battery, which are immersed in an electrolyte. In fact, it is found that connecting an external, pulsing electrical source to acupuncture needles increases the beneficial effect. When the pulse rate equals the heart rate, the effect is maximized. Interestingly, the beating of the heart is another phenomenon triggered by electrical impulses. That ch’i seems to be associated with an electrical aspect suggests that it may involve the known electrical action of nerve impulses on bodily cells. It is known that all muscular action results from the electrical stimulation of muscle fibers by nerve impulses from the brain and spinal cord. A human body has on the order of a hundred billion nerve cells and an astronomical number of neural connections and interconnections. Even when we have no intention to do a physical action, nerve impulses to muscles continually occur but well below the level that would cause external muscular action. This constant background stimulation keeps muscles in tone, and were it absent, muscles would sag and not be ready to respond when required. For example, people who suffer from Bell’s Palsy, which is a disorder of the facial nerve that controls the facial muscles, can experience drooping of the lower eyelid and the corner of the mouth on the affected side. Alternatively, background stimulation that is too strong can cause tremors and tics. It is not far-fetched to think that this background stimulation may play a part in initiating cellular streaming or other beneficial cellular activities that facilitate absorption of oxygen and nutrients and release of waste products. Next, consider that it is known that when you simply watch someone do an action or even imagine that you are doing it, your brain sends nerve impulses to stimulate the fibers of exactly the muscles that would cause that action, with no external muscular action occurring. Athletes utilize this fact to practice movement mentally, without any exertion, even when physically exhausted. Doing T’ai Chi or Ch’i Kung (Qigong) involves moving in a relaxed and precise manner, with an awareness of every part of the body and with all parts unified as a whole. Doing such movement can be expected to produce a high degree of neural activation of cells, resulting in an increase in the cellular absorption of oxygen and nutrients and the release of waste products. At the same time, such practice involves minimum muscular tension, which is consistent with the idea that any stiffness would hinder background cellular movement. Thus, in the T’ai-Chi classic, The Essence of T’ai Chi Ch’uan: The Literary Tradition. it is written, If there is ch’i, there is no li (external strength) [p.49]. 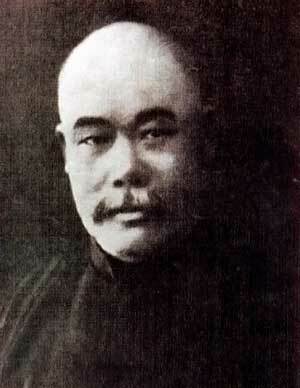 In the words of Yang Cheng-fu “Use the mind and not force. In practicing T’ai Chi Ch’uan the whole body relaxes.” [ibid. p. 87]. It is conceivable that highly skilled T’ai-Chi and Ch’i-Kung practitioners, who are sensitive to ch’i and able to utilize it for healing, can intentionally regulate their background nerve impulses to be much more intense than those of ordinary people. The fact that some high-level Ch’i-Kung masters tremble when transmitting ch’i suggests that they may be elevating their background nerve impulses to be slightly above the threshold of external muscular action. By incorporating the above idea that ch’i is neurologically stimulated, I added a new dimension to my teaching of Ch’i Kung. For example, some beginners have difficulty in recognizing ch’i even with the exercises that I teach. The remedy now includes my explaining my interpretation of ch’i and saying, “Imagine that you are tensing your hands without actually doing so.” These ideas have also improved my own practice of Ch’i Kung. Editor's comments: The original article from which this entry was taken and abridged to fit the style and format of Qi Encyclopedia may be found at http://chuckrowtaichi.com/ChiInterpretation2.html. It also appeared in Qi Journal Vol. 21. No. 3: Autumn 2011. ^ This article is an amplification of some of my ideas about ch’i that I wrote about in my first book about t’ai chi: Robert Chuckrow. T’ai Chi Ch’uan: Embracing the Pearl. Rising Mist Publications, Briarcliff Manor, NY, 1995, pp. 17–19; republished as The Tai Chi Book, YMAA Publication Center, 1998, pp. 20–22. ^ Short videos of protoplasmic streaming at Protoplasmic Streaming and Slime Mold cytoplasma transport .